This video provides a step-by-step guide on how to prepare and administer VYXEOS. VYXEOS, daunorubicin and cytarabine, liposome for injection is indicated for the treatment of adults with newly-diagnosed therapy-related acute myeloid leukemia, t-AML, or AML with myelodysplasia-related changes, AML-MRC. Warning: Do not interchange with other daunorubicin and/or cytarabine-containing products. VYXEOS has different dosage recommendations than daunorubicin hydrochloride injection, cytarabine injection, daunorubicin citrate liposome injection, and cytarabine liposome injection. Verify drug name and dose prior to preparation and administration to avoid dosing errors. For the reconstitution of one VYXEOS vial, you will need a sterile syringe, needle, Sterile Water for Injection, VYXEOS, and an IV bag containing 500 milliliters of either 0.9 percent Sodium Chloride Injection, USP or 5 percent Dextrose Injection, USP. VYXEOS vials should be refrigerated until needed for preparation. VYXEOS is a cytotoxic drug. Follow applicable special handling and disposal procedures. VYXEOS contains both daunorubicin and cytarabine at a fixed molar ratio. The calculation to determine the volume of VYXEOS required per dose is based on the dose of daunorubicin. You will then use the patient’s body surface area, or BSA, to complete the calculation. To determine the volume of VYXEOS needed for the dose, multiply the patient’s BSA by the daunorubicin dose, then divide by 2.2 milligrams per milliliter. After reconstitution, each vial of VYXEOS will contain 20 milliliters for administration. Based on the volume required to prepare the dose, remove the appropriate number of VYXEOS vials from the refrigerator. Let the vials rest for 30 minutes, allowing them to equilibrate to room temperature. VYXEOS is supplied as a sterile, preservative free, purple lyophilized cake. Now that you have completed the setup, you can begin preparing VYXEOS for administration. Once the VYXEOS vials have reached room temperature, withdraw 19 milliliters of Sterile Water for Injection using aseptic procedures. 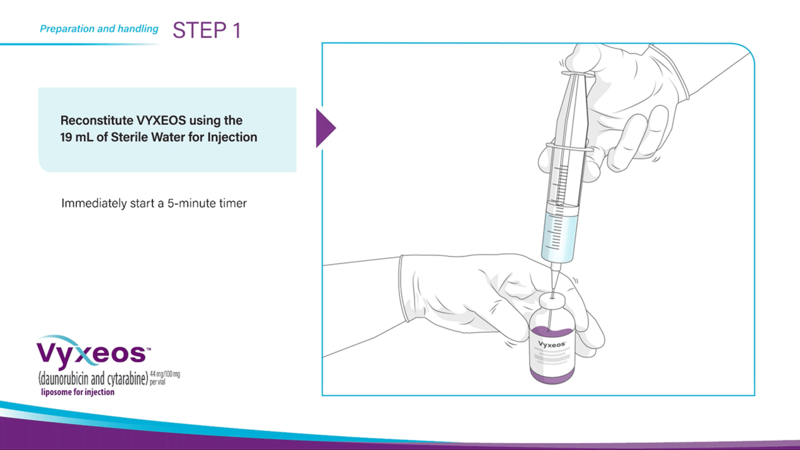 Reconstitute VYXEOS with the 19 milliliters of Sterile Water for Injection and immediately start a 5-minute timer. Begin gently swirling the contents of the vial for 5 minutes, while inverting every 30 seconds. Be sure to continue swirling the vial as it is inverted. It is very important not to heat, vortex, or shake the vial at any time during this process. After reconstitution, let the vials rest for 15 minutes. The reconstituted product should be a purple, opaque, homogeneous dispersion, essentially free from particulates. If the reconstituted product is not diluted into an infusion bag immediately, refrigerate at 2 degrees Celsius to 8 degrees Celsius for up to 4 hours. After the 15-minute rest period, gently invert each vial 5 times for further dilution, then aseptically withdraw the calculated volume of reconstituted product from the vials with a sterile syringe. Transfer the calculated volume into an infusion bag containing 500 milliliters of 0.9 percent Sodium Chloride Injection, USP or 5 percent Dextrose Injection, USP. Discard any residual product remaining in the vial. Gently invert the IV bag to mix the solution. This process should result in a deep purple, translucent solution. Prior to administration, inspect the solution in the IV bag to ensure that it is a homogeneous dispersion, free from any visible particulates. Only solutions without visible particles should be used. If the diluted solution is not used immediately, store in the refrigerator at 2 degrees Celsius to 8 degrees Celsius for up to 4 hours. Administer VYXEOS by constant IV infusion over 90 minutes via an infusion pump through a central venous catheter or a peripherally inserted central catheter. Do not use an in-line filter. Do not mix VYXEOS with or administer it as an infusion with other drugs. After administration, flush the line with 0.9 percent Sodium Chloride Injection, USP or 5 percent Dextrose Injection, USP. Please see additional Important Safety Information throughout and full Prescribing Information, including BOXED Warning.